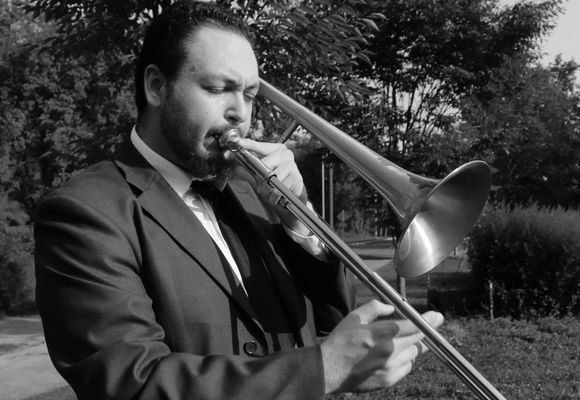 Ben Barnett is an up and coming trombonist on the New York jazz scene. He is a first call sub for Arturo O'Farrill's Afro-Latin Jazz Orchestra and The Cotton Club All-Stars, 2nd trombone in George Gee's 17-piece Swing Orchestra, and leads his own quartet around New York City. He is fascinated by the music of the 1940's, 50's, & 60's, including such by Charlie Parker, Dizzy Gillespie, Hank Mobley, Horace Silver, Donald Byrd, J. J. Johnson, Sonny Rollins, and his favorite musician, Kenny Dorham. As the grandson of a professional opera singer on one side and a piano prodigy on the other, music has been a force throughout his entire life.